Misjudgments fostered in part by closed-mindedness may be regrettable, but they are also imaginable in many administrations. The difficulty in getting international consensus for the Iraq war was frustrating, for example, but explicable given the enmeshment of French, Russian and German business interests in Iraq. All of this, in other words, is understandable, and requires no theory of the new conservatism to explain it. What is not understandable, however, is the almost non-existent preparation for war made by the Bush administration, the stunning lack of foresight about the dangers of Iraq after invasion, and the continued reluctance of the administration to adjust once clear mistakes had been exposed. Given the stakes involved and the immense difficulty of the task, it is still difficult to explain a war-policy of what can only be called reckless intransigence. Some of the errors can be attributed to the fog of war, to the inevitable mismatch between theory and practice, between war-plans and an actual conflict, taking place in a deeply divided country sealed off for years from most outside contact, and exhibiting what can only be called post-totalitarian syndrome. No one should expect perfection. But what we witnessed was something far more disturbing: a refusal to account for reality, to acknowledge error, to prepare for all contingencies. In searching for an explanation for that, we have to return, I think, to the kind of conservatism George W. Bush had internalized. In that world-view, what mattered was the ideological analysis: good versus evil. What mattered was the assertion of the United States' right to act alone if necessary to defend its own security. What mattered was the zero-sum analysis that we had to choose between war against Saddam and a potential mushroom cloud in an American city. It was this rigid and abstract analysis that essentially abolished the idea that the war was subject to rational debate... The fundamentalist makes his mind up instantly, makes the fundamental decision, and cannot, by necessity, stop short at a later date and ask himself if he's right. Such second-guessing undermines his entire worldview. It threatens his inner psychological core. Part of this brittleness can be understood as public relations. War-leaders do not want to be seen second-guessing strategy in public. Much of the opposition in America would have jumped on any concession to reality by the president and used it against him. But again, this doesn't fully explain the rigidity of the Bush White House, its imperviousness to empirical criticism, its insistence on the inerrancy of its leader, and its ruthlessness toward critics. What does help explain it is the fundamentalist mindset. A strong inerrant leader is typical of such religious groupings; deference is regarded as the natural response to such a hierarchy; criticism is immediately conflated with sin or weakness or treachery. Loyalty, however, is always valued - even when it appears ludicrous." 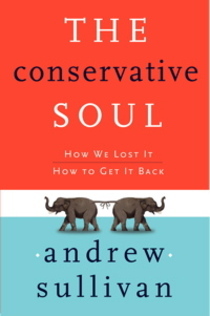 That's from my new book, "The Conservative Soul: How We Lost It; How To Get It Back," which tries to explain at a deeper level the hijacking of conservatism by this fundamentalist president and the Rove machine. We are surely in the ludicrous phase now. From Michael "Heckuva Job" Brown to Donald "Fantastic Job" Rumsfeld, we see the same psychological profile. Woodward is right about this president. This is not conservatism. This is simply denial of reality. In these perilous times, it is beyond disturbing.